In keeping with our goal to stay current on the latest trends and take advantage of learning experiences, several JJCA folks attended the recent AIA conference in New York City. Morgan Powell was just one of the record-breaking crowd of more than 20,000 attendees, the largest gathering of architects in the convention's history. Morgan not only brought home some great swag (like a VR headset), she gathered valuable information and gained new perspective on her chosen career. When asked what she learned about architects, Morgan says she discovered that many of them really do wear grayscale clothes and John Lennon glasses! But she also learned that architects come in all different shapes and sizes and from all different parts of the world. And the experience confirmed that architecture is not just about buildings: it's about the environments and the people who inhabit them. One of Morgan's most interesting takeaways relates to the concept of universal design, which broadens traditional thinking around accessible vs. non-accessible design to incorporate a whole spectrum of design possibilities for ALL people, regardless of ability or disability. Her second takeaway is particularly applicable for JJCA, given that our work has spanned the globe at times. Morgan learned that the realities and possibilities of architecture in other parts of the world are so vastly different than what is possible is the U.S. For example, one presentation featured a hospital in Singapore that was completely naturally ventilated. One very cool product was an audio/visual system called “Habitat Soundscaping – Human + Nature,” a system that integrates sounds of nature with complementary visuals. For example, in-ceiling speakers play sounds of dripping water while a real water feature is the main focus of the room. This is a great alternative to typical sound-masking systems that provide only white noise as a sound barrier. Click here for more info on this cool product! Of course a trip to NYC can't be all work and no play, and Morgan was able to tie the two together. 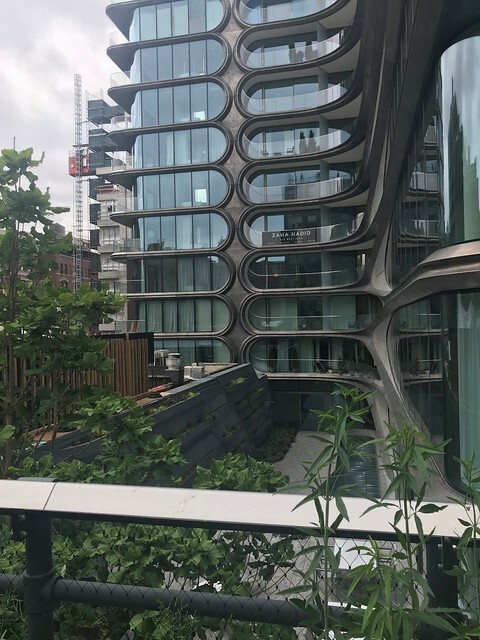 She took a walk along the highline pedestrian bridge through the city, photographing the amazing architecture, including the last project Zaha Hadid influenced. Morgan also paddled her way through the middle of Central Park! Talk about great perspective. What a way to see the city!